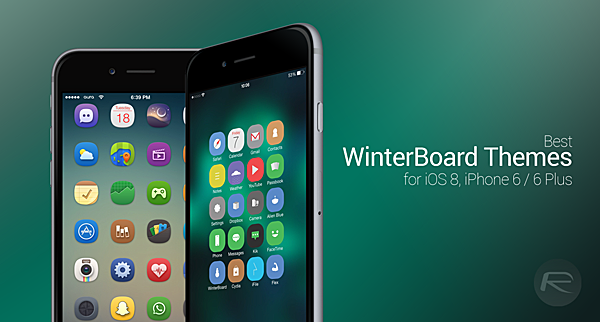 As we noted earlier, there is a way to get the currently unsupported WinterBoard working with iOS 8, and if you happened to follow that initial coverage, we’re now going to point you in the direction of some great themes. Dependent on what kind of aesthetic you’re looking to achieve, you may or may not find our run-down particularly endearing, but as ever, we’ve sought to offer a diverse selection in order to help you find at least one theme to your taste. 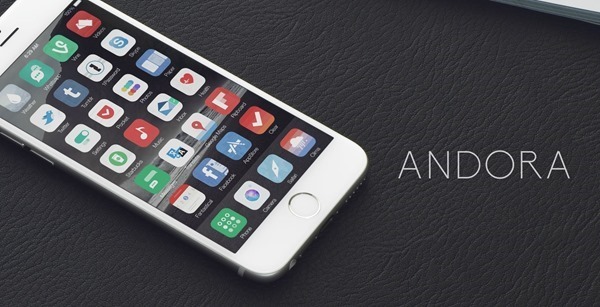 The following themes support iOS 8, iOS 8.1, iPhone 6 and iPhone 6 Plus. This theme offers a clean, understated look that will go down well with the minimalists. If you’re searching for a more interesting, less-bright alternative to stock, then this one’s for you. Andora can be downloaded from the MacCiti repo in Cydia, and costs just $1.99. This is the theme where square meets circular. The stock icons have rounded edges, but this theme offers even more curvaceousness, and with some clean, cartoonish graphics, it compliments the look of iOS delightfully. 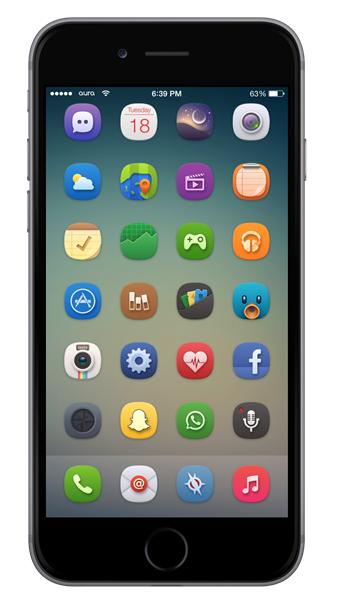 Aura iOS 8 is available from the ModMyi repo, and costs just $2.99. This nicely-named theme will greet you with monochromatic, translucent icons, and we’re big fans of this one here. Of all the themes featured, this is our favorite, and if you’re not feeling the strong colors of the native appearance, give this theme a blast. 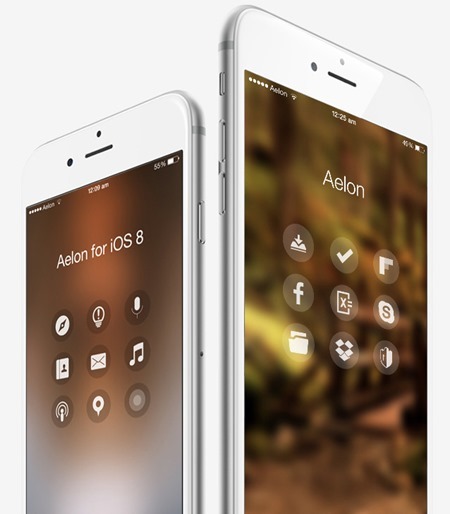 Aelon iOS 8 is available from the MacCiti repo, and costs just $1.99. This theme takes design cues from both Windows Phone and Google’s Material Design with Lollipop, and does so very nicely indeed. We’ve already thrown our hat into the ring and declared our favorite, but if there was a runners-up medal on offer, Fizz would claim it hands-down. Fizz is available from the MacCiti repo, and costs just $1.49. 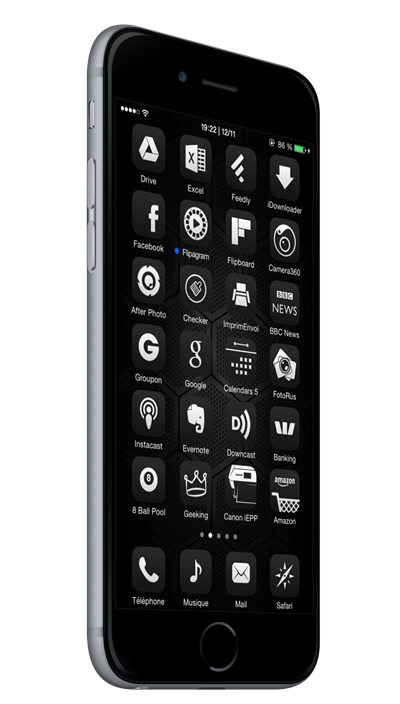 This theme is unashamedly black and white, and like the others, and once again, is very easy on the eye. Perhaps not as interesting as some of the others, it includes dozens of icons covering the most popular apps in the business, and if you’re in the hunt for a drastically new look, 0bscure 7 is the one you should pick. 0bscure 7 is available from the ModMyi repo, and costs just $0.99. So, there you have it. We hope you find something you like, and if you do have a favorite, be sure to leave a comment below. Ayeris is still probably one of the best iPhone themes. It’s at least worth a mention. How did you guys set up the icons on the screenshot on the Fizz theme? Why would they mention a theme that hasn’t been updated for iPhone 6 and 6 Plus (or iOS 8 for that matter) in this article? Read the title. hmm the wallpaper? thanks for that I used home screen design! so thanks a lot! I have it working 100% on my phone. I realize I don’t have a 6 or 6+ (so I guess that’s true, I’m on a 5s). How about not mentioning a theme that has very few icons updated for it? Such as aelon. It looks horrible without all the icons updated for it. My iPhone 6 looks awesome with ayeris (after I patched it with the new icon file names). Still, can’t wait for Sentry’s new Addendum theme. Aura is currently not compatible with 6+ . Developer offering refund on Cydia. On my Iphone 6+ Aura works perfectly fine but i have some problems with 1one and Soft themes .The clock icon is pixelized and no frames around it.Also i when i select round icons in 1one theme it wont apply.